The maintenance of stable extracellular iron concentrations requires the coordinated regulation of iron transport into the plasma from dietary sources in the duodenum, recycled senescent red cells in macrophages, and storage in hepatocytes. Hepcidin is a 25-amino-acid disulfide-rich peptide that is synthesized in the liver and acts as a systemic iron-regulatory hormone by regulating iron transport from iron-exporting tissues into the plasma. Hepcidin acts by binding to the iron exporter ferroportin to induce its internalization and degradation, thereby blocking cellular iron efflux. Hepcidin production is mainly controlled by erythropoietic activity in the bone marrow, the amounts of circulating and stored body iron, and inflammation. The discovery of hepcidin has changed our understanding of iron disorder pathophysiology. Iron-overload diseases can be caused by the absence of hepcidin, and anemias can arise from increased hepcidin production. Several hepcidin mutations result in juvenile hemochromatosis. 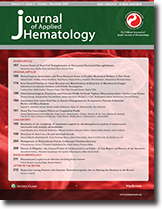 The majority of juvenile hemochromatosis cases are due to mutations in hemojuvelin, which regulates hepcidin production. Hepcidin concentration measurements could therefore be useful when diagnosing iron disorders and would provide further insight into hepcidin regulation in vivo. The development of hepcidin agonists and antagonists may provide useful therapeutics for the treatment of iron disorders. During blood bank storage, platelets undergo a number of alterations that may affect their viability after transfusion. The aim of this study was to assess platelet apoptosis in blood stored at 37°C, as a model for studying the platelet storage lesion. The results showed that storage was associated with a significant increase in the percentage of platelets expressing phosphatidylserine. Furthermore, a significant increase in the number of dead platelet and the percentage of platelets with depolarized mitochondrial membrane potential was detected. Moreover, the expression of CD42b and CD47 significantly decreased after 48h of storage at 37°C. When the results were compared with platelets stored under standard blood bank conditions for 6 days were observed, however the degree of apoptosis was less in platelets stored in blood banks at 22°C. In conclusion, storage of platelets at 37°C greatly accelerates platelet apoptosis and may be useful model for studying the platelet storage lesion. Sickle cell anemia (SCA) in children exhibits wide clinical diversity. SCA's variable and unpredictable phenotypic expressions pose significant management challenges to caregivers and physicians alike. We therefore introduced a scoring system to evaluate the clinical severity of SCA in Nigerian children using simple clinico-laboratory parameters, and related the severity to their sociodemographic, hematological, and biochemical profiles. The total severity score of the 115 children ranged from 1 to 24, with mean ± standard deviation of 9.85 ± 5.22. Approximately one-third, 33.9% had mild disease, 55.7% moderate disease, and 10.4% severe disease, according to our severity score grading system. Age was positively correlated with disease severity score (r = 0.61; 95% confidence interval [CI] = 2.1-3.7; P = 0.001). Also, presence of dactylitis/hand-foot syndrome at first presentation, total white blood cell count, absolute neutrophil count, platelet count, and serum bilirubin concentration were significantly higher among those with severe disease. Conversely, hemoglobin F (HbF) percentage was significantly higher in those with mild disease (5.4 ± 3.2% vs. 3.1 ± 1.3%; P = 0.001). On multivariate analysis, dactylitis/hand-foot syndrome as first manifestation (odd ratio [OR] = 0.4; 95% CI = 1.7-3.5; P = 0.043 and HbF% (OR = 0.6; 95% CI = 0.2-0.7; P = 0.013) were the only independent predictors of severe disease. Routine evaluation of disease severity in children with SCA will help to prospectively identify children at higher risk for a turbulent clinical course who may need more active management and monitoring. We describe herein a series of 14 patients with sickle cell disease who were confirmed to have either primary or secondary antiphospholipid syndrome. The aim of this paper is to emphasize the diagnostic difficulties and management challenges involved in these cases. The King Khalid University Hospital (KKUH) Blood Bank suffers frequent shortages of blood components because it depends partly on involuntary blood donors, and is expending considerable effort to increase its pool of voluntary donors. The present study aimed to investigate the attitude of King Saud University (KSU) students towards blood donation to determine the factors that would increase voluntary blood donations at KKUH. A cross-sectional study was conducted at 6 colleges (n = 600) in KSU, Riyadh, between February and March 2012 using a self-administered questionnaire distributed to donors (n = 300) and non-donors (n = 300). All respondents were male. Ninety-eight percent of KSU students agreed that blood donation is important; 92% of non-donors believed that blood bank centers are in need of voluntary blood donations. Seventy-six percent of non-donors were opposed to importing blood, reflecting their opinion that blood should be available locally. The majority of the students did not consider fear or donation venue strong discouraging factors against blood donation and objected to monetary compensation, but would accept a token or gift. The present survey highlighted the need to invest in awareness and motivational campaigns on blood donation among university students so that current donors will continue donating and non-donors will be encouraged to begin donating. Addressing the issues raised by the non-donors will pave the way to their becoming regular blood donors. This will eventually facilitate the establishment of a blood donor system based on voluntary, non-remunerated donations. Leukemia cutis is a well-known, although rare, skin manifestation of acute myeloid leukemia (AML). The presence of leukemia cutis carries a poor prognosis for patients with AML. I report the case of a patient with AML with normal cytogenetic risk factors and leukemia cutis. Despite a normal cytogenetic profile, that patient displayed Flt-3 abnormality, which was detected by molecular techniques. The presence of this molecular abnormality is considered to be an unfavorable factor. In myeloma (Kahler's disease), most neoplastic plasma cells are easily recognizable and are thus diagnosed without difficulty. However, some of the cells may pose a considerable diagnostic problem, since they exhibit unusual cytological features that lead to erroneous diagnosis. Herein, we present 2 such cases. The first presented with cytomorphology similar to T-cell lymphoma/leukemia, due to the cerebriform nucleus. The second had an unusual clinical presentation of congestive heart failure with plasmablastic morphology leading to differential diagnosis of lymphoblastic lymphoma. Interestingly, both patients were negative for the Bence-Jones protein according to urinalysis, and the second case was negative for M (myeloma) band according to serum electrophoresis.